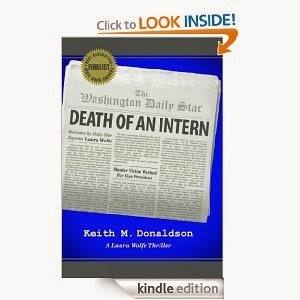 Death of an Intern was originally published in 2004 and has a slightly dated feel. Perhaps because I work in the District of Columbia, the setting for the novel, and am a bit of a new junkie, it is just my perception. That being said, Death of an Intern is a creative thriller introducing intrepid newspaper reporter Laura Wolfe, whose investigative skills and dogged pursuit of truth would make Woodward and Bernstein proud. Wolfe is investigating what appears to be a serial killer who mutilates pregnant women and steals their fetuses and is shocked to recognize the second victim as an intern she and her husband met at a party the Vice President hosted for his parents’ anniversary. This discovery makes the investigation personal for Wolfe, particularly since she is also pregnant. Actually, the author’s focus on Wolfe’s health, diet, rest, and stress reduction surrounding Wolfe’s pregnancy was the only part of the book that I found annoying and somewhat pandering to women. Employers do not become solicitous of expectant mothers and professional women do not and should not be treated differently in the workplace because of pregnancy. [I’m back off my soapbox]. Death of an Intern is the first installment in the Laura Wolfe series and an excellent first effort. The story is convoluted. It is not a page-turner. But it is a solid entry into a crowded literary field. I didn’t love it but I liked it. A solid 3 of 5 stars.